The Castillo de Bellver was carrying 252,000 tons of crude oil to South Africa on August 6, 1983. Once the ship was about 70 miles off of Cape Town, it suddenly caught fire, which caused the ship to drift and then break into two separate pieces. The stern, which may have been carrying about 100,000 tons of oil, was capsized about 24 miles from the South African coast. 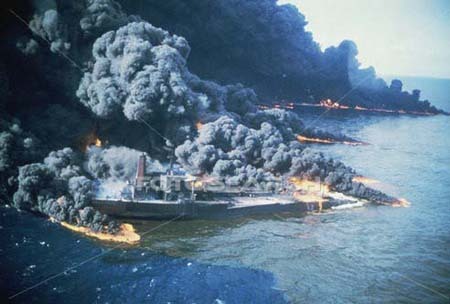 Once the flames died down and no more explosions were expected, the ship’s bow was towed away from the coast and then explosive charges were used to sink it. 50,000-60,000 tons of the oil may have sank into the sea or burned during the fire. Thankfully, the oil never reached the coastline. It was headed towards the coast but a wind shift changed the direction of the oil back away from the coast. There wasn’t much clean up with this oil spill though dispersants were used. The impact wasn’t as serious as it could have been and wildlife seemed to be able to cope.